No matter what Roy is hoping, it’s not ending that way. Hoping to convince Claudia that nothing happened between her and Roy, Nina drops in on Claudia at the Flyer Diner. The only one tougher on her is fellow musician Lori, but Nina manages to get Claudia to go into how she and Roy met during the wars before the SDF-1 arrived on Earth. However, despite Roy’s various attempts to woo her over the years she still saw other women hanging around him and wouldn’t commit to him. She also met Virgil, the guy Roy rescued last issue, who tries to contact her when she gets home. They set up a date. Meanwhile, Leonard tries to get Da Silva to get Jessica (who managed to survive after all) off of Macross Island but his superiors are done with his faction of the Faithful. Then Da Silva’s man shows up to meet with the Salamander…and it’s Virgil! What they got right: I like that Nina finally tried to set the record straight, even if Claudia is still being a pain. What they got wrong: And I know where this story is headed, even without remembering the rest of the story arc. Claudia and Virgil will date, Roy will keep trying to prove he wants to be with her (more on that in a moment), Virgil is going to betray them and is either using Claudia or assuming she’ll go with him after learning whatever evil plan he and Da Silva have concocted, and she’ll end up with Roy. I’ve seen it before. I think a couple in one of my mom’s old soap operas had the same couple do that twice. As far as Roy not telling her he cares for her exclusively…HOW MANY OTHER WOMEN DO YOU THINK ROY WOULD SWIPE A VERITECH FOR TO BEG FOR FORGIVENESS! It’s like she’s trying to stay mad at her, or rather the writer is trying to force this story in. Finally, there’s the art. I think she’s still in the business and I hope she improves, but there are panels without backgrounds and posing my friends and I used to do in middle and high school (and I’ll be honest I’m still trying not to fall back into). I hope she has gotten better and we all have to start somewhere. I see the potential but I’m not sure she was there yet, even in a publisher as small as Academy was. Recommendation: My problems with the story are primarily taste rather than critique, but it’s sort of an important issue to follow events. That’s the only reason to really track this one down. 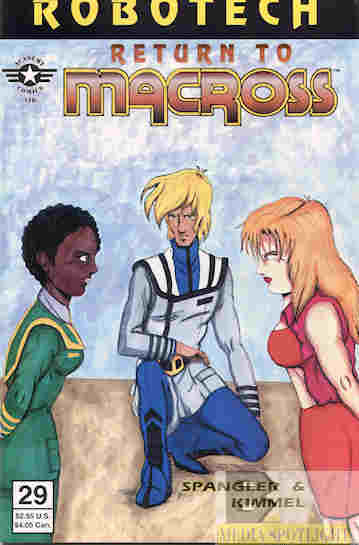 Posted by ShadowWing Tronix on December 14, 2018 in Animation Spotlight, Television Spotlight, Yesterday's Comics and tagged Academy Comics, Anatole Leonard, Claudia Grant, Da Silva, Nina Lang, Robotech: Return To Macross, Roy Fokker, Virgil Smythe. Are you saying that Roy won’t be getting a chocolate and vanilla ice cream sandwich????? And hey if this artist was drawing the same way we all were in our fold em up comic books we created in middle school and high school, then maybe we should have applied for a job with Academy Comics back in the 1990s! Well, more like the other member of our current trio was, so it was still decent.